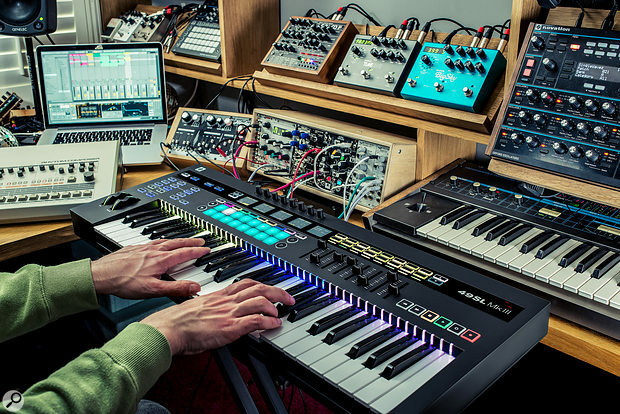 Designed to be the control centre of your studio, regardless of whether you’re DAW‑based, controlling MIDI‑equipped synths, living the modular dream or all of the above, the Novation SL MkIII series could be the most functional keyboard controllers going. Coming in 49- and 61‑key versions, the SL MkIII sports USB, MIDI in, out, and out 2/thru on five‑pin DIN, plus two CV/gate and Mod outputs, as well as three pedal inputs, and an analogue clock out for unequalled connectivity. The new controllers feature a built‑in Circuit‑style eight‑track polyphonic sequencer that can drive any output, and a semi‑weighted keybed with super‑fast scan rate for more expressive playing, say Novation. Though its makers worked with Ableton to deliver unprecedented integration with Live, the SL MkIII series also integrates with other DAWs thanks to HUI compatibility. Rounding out the picture are eight faders and eight knobs, RGB velocity‑sensitive pads and buttons and colour LCD screens to give you full visibility of your parameters. We’ve already got our review unit on the test bench and can’t wait to bring you a full review. Until then, visit https://sosm.ag/SLMk3news to watch our overview video. The 49SL MkIII will retail for £539.99/$599 while the larger 61SL MkIII will cost £629.99/$699.